“Comfortable chairs” force you to slouch, putting stress on your back. Use a supportive chair that allows you to sit up with your feet flat on the floor (as in the diagram). Limit sitting to 20 minutes maximum at a time, then get up and move around. Avoid sitting cross-legged, or with your knees too far apart. Walk at a steady pace for 10 minutes, 5–8 times daily, stopping if aggravation is caused. Women should avoid high heel shoes as they force the spinal muscles to work harder, which can further aggravate back pain. Rest on a firm, supportive surface such as the floor, bed or yoga mat. Place a rolled up towel or cushion 2-3 inches thick under your head. You should be able to swallow comfortably. 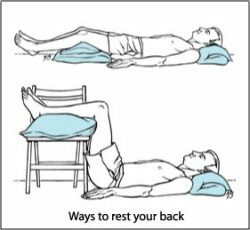 Lie with a pillow underneath your knees, or with your lower legs supported by a chair or cushions. If more comfortable, you can have just one knee raised, or alternate between positions. Relax your arms by your sides, or rest your hands on your abdomen and elbows on the floor. Try to rest for at least 20 minutes. Don’t raise your head or arms as this prevents the neck and lower back muscles from relaxing properly. After resting gently roll onto all fours, get up slowly and walk about. Don’t use your stomach muscles when sitting up as this can strain the lower back muscles. On your side: place ONE pillow between your knees, preventing the top leg from twisting the pelvic and lower back area, and ONE pillow under your head, ensuring it is at the correct height. 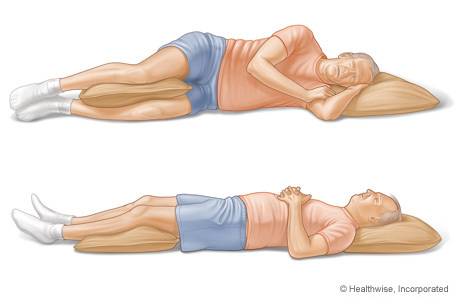 On your back: when sleeping on your back place ONE pillow under your knees to support your lower back and ONE pillow under your head. Ice Pack: Apply a wrapped ice pack (in a damp cloth) ASAP after treatment to the inflamed area for 10 minutes every 2 hours until your practitioner indicates otherwise. 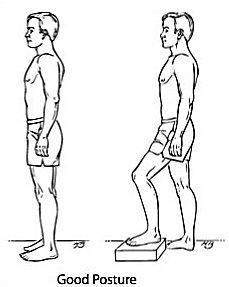 If you must stand for long periods, rest one foot on a low stool (as in the diagram below). Every 5 minutes, switch the foot you’re resting on the stool. Maintain good posture, keeping ears, shoulders and hips in a straight line. When you pick up anything get it as close to your body as you can, keeping your back straight. All drugs have side effects. 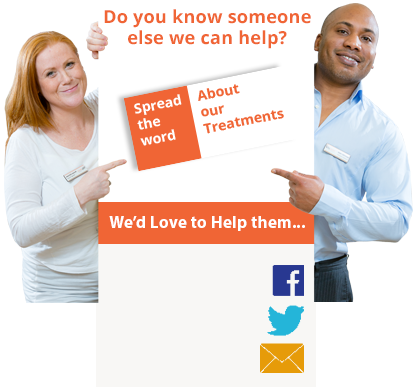 The use of pain killers and anti-inflammatory drugs only mask symptoms, not fix the underlying problem. Although not strenuous, some housework and gardening can affect your recovery. Refrain from activities such as vacuuming, ironing and weeding, until your practitioner indicates otherwise. Water: the discs of the spine require water to maintain their supporting/shock absorbing role. Drink 1.5 litres per day. Reduce caffeine, refined sugars, alcohol and smoking as they all affect blood circulation, slowing the healing process. Consider taking supplements and natural anti-inflammatories, such as Devil’s claw. Try the following exercises 6 – 8 times a day, until your practitioner indicates otherwise. Whilst lying back on a firm surface with knees bent, slowly roll both knees to one side, hold for 5 seconds and repeat to the other side. Rest your arms by your sides, or with your hands resting on your abdomen, elbows on the floor. Repeat 10 times on each side. Breathe slowly and relax throughout. Whilst lying back on a firm surface, gently pull one knee with both hands to your chest or as far as is comfortable, hold for 5 seconds then gently lower. If you feel increasing discomfort during either exercises ask your Jason you Osteopath, at VitaPhysical whether to continue or modify the exercise.